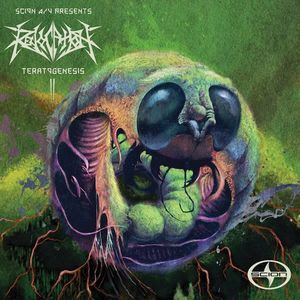 This is a free E.P by Revocation which may be downloaded legally here. It downloads at 320 bitrate for five extremely well crafted songs. Revocation hit the metal world only in 2008 with their long awaited debut 'Empire of the Obscene'. This was enough to get scooped up by Roadrunner Records, which gave way to 2009's excellent 'Existence Is Futile', with many noting the prowess of young guitar virtuoso David Davidson, which has led to some dubbing Revocation the next Metallica or Megadeth. Fusing technical death metal and thrash metal together for a fresh style of music that moved forward with as much reverence for the past, Davidson's solos demonstrate astonishing confidence and skill for a young man, and this brought their 2011 album (yeap it was only last year) Chaos Of Forms to mainstream attention. The thing about Revocation is that they truly are the next big thing; accessible, complex, technical, old-school and clearly having fun just listening to the record. And if Teratogenesis is any indication, this band can only keep getting better. Starting off with 'The Grip Tightens', the title is apt for a truly refined sound that sounds even tighter than previous records. And there is a sense of urgency too, Davidson launches to a blinding solo just one and a half minutes into the song, after a well crafted chorus that can be enjoyed both in studio quality and in a live setting. There is also a new concentration on groove in the second song 'Spurn The Outstretched Hand'; vocals are more bearable and guitarists always give time for the bass to have some show off time but he rarely produces much to be interested in, whilst drums manage to keep up with the varying song tempos. This may be the one and only big flaw of the album, and the band on the whole, that none of them match up to Davidson's guitars. But think about it, did Metallica and Megadeth come to power with equally talented band-members? Perhaps this is what gives the music its youthful accessibility, its human element despite the technical wankery, and not in the emotional way, but in the reckless teen way, a bridge that metaphorically gaps the guitar-hero days with the newfound anger with political systems, and if that isn't metal, then you are obviously a Megadeth hater. One of the few bands of today with a serious amount of potential, watch out for them in years to come.